(BPT) – Crafting is a great way to relieve stress and express your creative side — and fortunately, you don’t have to be a master craftsman — or spend a fortune on materials — to have fun and enjoy the benefits. Here are four easy “upcycled” projects to get your creative juices flowing. A cork cell phone stand? Wine-not?! Start by stacking the corks in a pyramid shape, applying just a thin layer of the glue to where the corks meet. Press each bond together for 30 seconds to ensure a stronghold. Next, just add one extra row of corks at the bottom of the phone to rest on, and repeat with the adhesive. Allow curing for 30 minutes. In less than five minutes, you’ve created a unique resting place for your phone that keeps it handy while you work at your desk or look up recipes in the kitchen. For an easy, budget-friendly crafting project, Dinah recommends scouring flea markets and garage sales for old ceramic boxes. With a little dressing up, they make the perfect jewelry box for you or a young one. Start by spray-painting the box in your desired color. Once dry, embellish with rhinestones or old figurines — even old decorative salt or pepper shakers. Simply dab a bit of adhesive on the item, then press into the box for 30 seconds to seal. It’s the perfect gift for the little princess in your life. One of Dinah’s favorite projects is creating an eye-catching bird feeder made from an old saucer and teacup. It’s a great way to repurpose old dishes that you no longer use, while also bringing some whimsy to the backyard. Simply lay the cup on its side on top of the saucer, and check to see where the cup and saucer touch. Next, apply the adhesive to these two areas to set and press together for 30 seconds. To keep the cup from rolling as it sets, place two small items on either side. After it cures for 30 minutes, it will be ready to fill with bird seed and hang. Beyond crafting for fun, use your new-found crafting skills to repair other household items such as flower pots and picture frames. Your first instinct may be to trash the pieces and shop for replacements, but by vowing to repair your items instead of replacing, you can save significant amounts of money, as well as hang on to irreplaceable heirlooms and items with sentimental value. 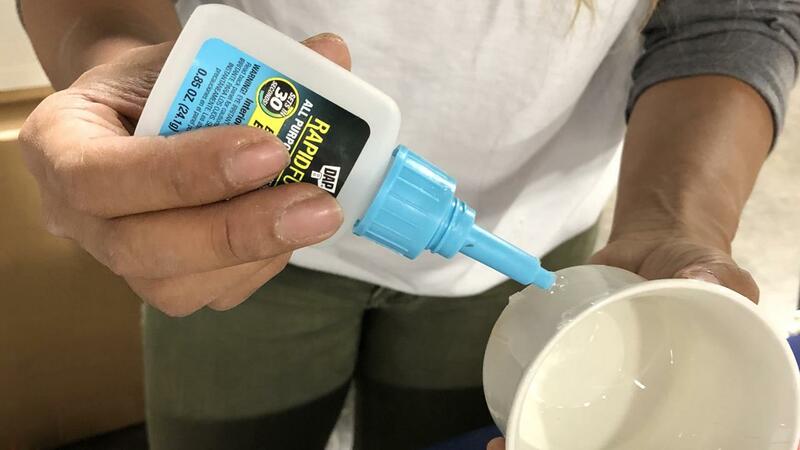 RapidFuse All Purpose Adhesive is a cost-efficient solution, as it bonds to virtually everything, sets in 30 seconds and fully cures in 30 minutes. In less time than it takes to find a replacement, you can be enjoying your old items once again.